Glentoran could be stripped of their Christmas Day Steel and Sons Cup triumph if they are found to have fielded an ineligible player. The Irish Premiership club's reserve side beat Ards 3-0 in the final but it has emerged the Glens might have broken competition rules in an earlier match. The issue is whether keeper Carter Dawson was eligible to play in the fourth round win over Wellington Rec. The Glens have already lost league points over Dawson's registration. Glentoran II manager Spike Hill has resigned over the matter. It is understood Dawson's signing did not make the 31 August deadline and he should not have played for the Glens until the January transfer window. Glentoran II have been docked the seven Reserve League points they won with Dawson in the team. "I feel badly let down," Hill told the Belfast Telegraph. "It is a sad day for me because I have had seven great years at the Oval. "Over the years a lot of promises have been made, but we have been fighting battles every day. "There comes a time when you have to say enough is enough." The player registration blunder is the latest controversy to beset the east Belfast club. The cash-strapped Glens have had problems paying a tax bill and there have been delays in paying players' wages this season. 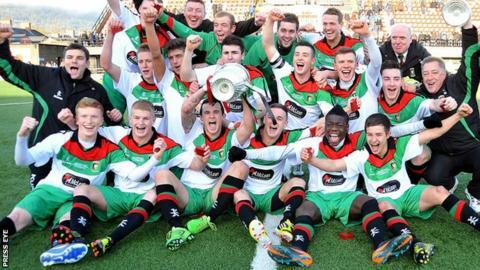 The decision on what to do about the Steel and Sons Cup has yet to be made by the County Antrim Football Association.